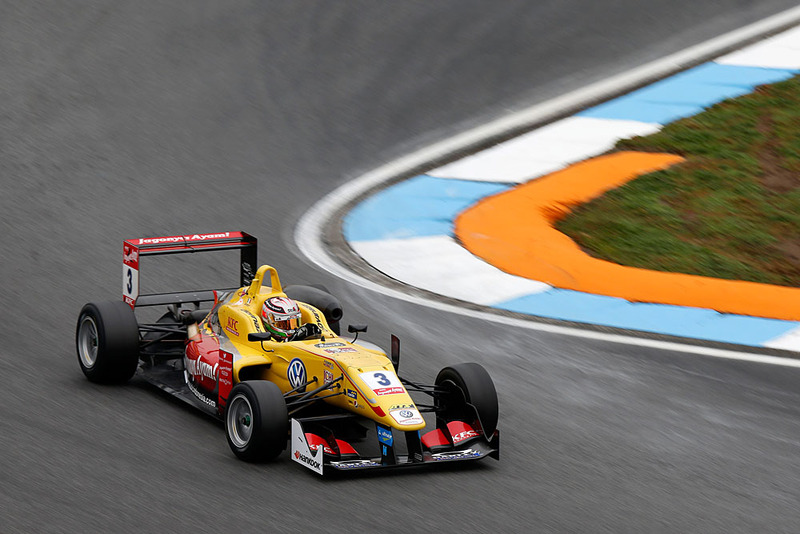 Antonio Giovinazzi claimed victory at a cool and grey Hockenheimring this afternoon, to secure the runner-up spot in the FIA European F3 Championship. Giovinazzi’s run was not without its challenges, as the Carlin racer was pressed by 2nd and 3rd place racers Jake Dennis and Felix Rosenqvist for the duration. Despite this, the Italian racer led from start-to-finish and he vaulted from pole position, although it did look for a moment as if Dennis had the best position as the field poured through the NordKurve. Defending the lead, Giovinazzi ran well wide over the run-off area, arguably gaining a pace advantage over the chasing pack, with Dennis and Rosenqvist slotting into the next two places. Although Dennis raised the issue over the team radio, the incident went without investigation – a matter that irritated the Prema Powerteam driver no end. The racing would be halted briefly on lap two when a spinning Alexander Albon brought out the safety car when he car became stuck by the turn one barriers. Giovinazzi enjoyed a brief stint in the lead when the race ran green from lap four, only for the event to be neutralised again when Nabil Jeffri’s overenthusiastic and ill-judged divebomb on Tatiana Calderon at the hairpin resulted only in a very broken Motopark car and a spun Carlin. From the lap eight restart Giovinazzi led again with a slightly reduced margin, but it was all to change one tour later when Rosenqvist passed Dennis for 2nd position. Immediately the Swede began to reel Giovinazzi in, with Rosenqvist holding the leader to a gap of 0.6s for several laps. Giovinazzi did endure one scare on lap ten, when he ran wide at the hairpin, leaving the door wide open for Rosenqvist; however Rosenqvist was not close enough on that occasion to slip by. Come the two-thirds marker, Rosenqvist started to hit trouble when a failing gearbox began to cost him time and did eventually rob him of 2nd place on lap 17, when Dennis slotted by – admittedly the Englishman was met with no defence. Thereafter the top two stayed as is, but Rosenqvist’s mechanical woes almost caused to fall behind Maxi Günther, but the Swede had enough over his new teammate to maintain the podium places. Out front Giovinazzi held a gap over Dennis, with the Italian taking his 6th F3 win of the season and the runner-up position in the European Championship. Günther enjoyed a battle of his own throughout the race as he held the experienced Alexander Sims at bay for the duration – this despite Sims having a huge off on the opening lap, when the Hitech GP man took his Dallara for a trip through the bumpy run-off area exiting the Mobil 1 corner. Mikkel Jensen scored a solid 6th place position, helped quite a lot when Albon spun off and Lance Stroll dropped behind the Mücke man. Race One winner Stroll continued in 7th place for the rest of the running, although there was far more excitement over the fight for 8th and 9th, as Sergio Sette Camara fought tooth and nail with George Russell, a fight eventually won by the Brazilian. Russell was hardly soft in his approach – several times from lap 11-17; the Briton was either alongside Camara or past the Motopark racer, only for the Brazilian to retake the position upon corner exit. 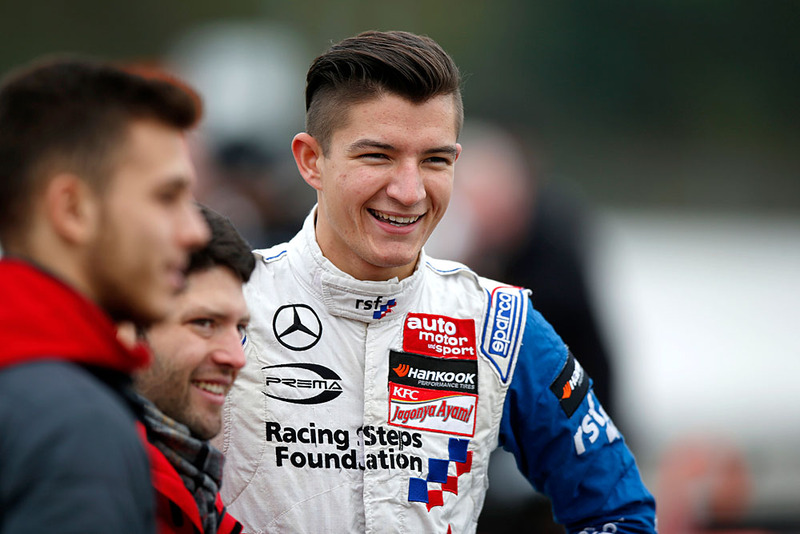 As the pairing held each other up, Markus Pommer joined the fight, but the former German F3 racer ran out of laps to extract more points from the race. In the continuation of another disappointing weekend, Charles Leclerc took 11th and the final point, having fought off the intentions of Callum Illot in the latter stages. Leclerc’s lowly finish drops the Monegasque racer to 4th in the championship, behind Dennis. With Dennis starting on pole tomorrow and Leclerc starting 16th, it is unlikely that we will see much change in the ultimate when the chequered flag waves on the season tomorrow.